Socialism watch: How progressive do we have to get? Here we've all been worried that Barack Obama's policies would spread our wealth all the way into socialism, and it turns out we're socialist already! Emphasis added. Barack Obama's admission that his policies would "spread the wealth around" has ignited a nationwide discussion of how progressive the tax system should be and how it should be used to redistribute income among Americans. Obama has been very successful in bolstering the conventional wisdom that the U.S. tax system does not place a significant enough burden on wealthier households and places too much of a burden on the "middle class." But a new study on inequality by researchers at the Organization for Economic Cooperation and Development (OECD) in Paris reveals that when it comes to household taxes (income taxes and employee social security contributions) the U.S. "has the most progressive tax system and collects the largest share of taxes from the richest 10% of the population." 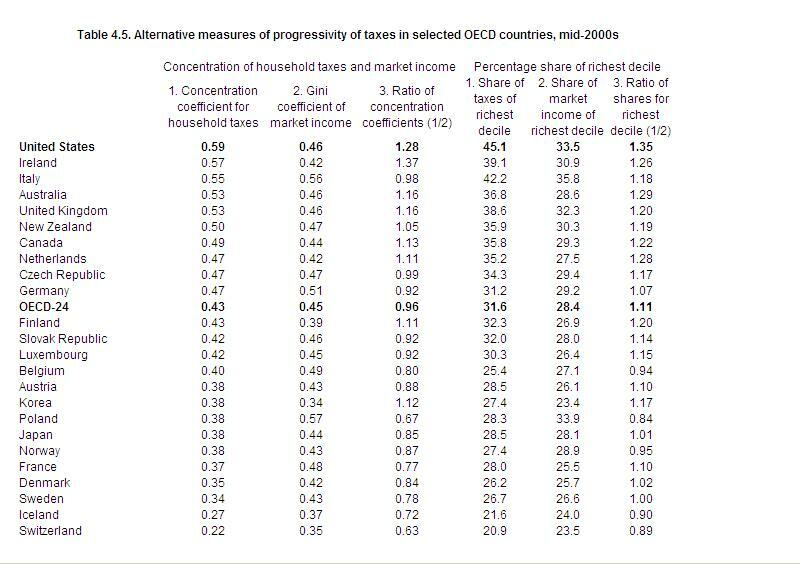 As Column 1 in the table below shows, the U.S. tax system is far more progressive—meaning pro-poor—than similar systems in countries most Americans identify with high taxes, such as France and Sweden. Not to brag or anything, but in 2007 my federal and state income taxes, wage taxes, and property taxes came to 41% of my income. So, excluding all consumption taxes (sales, gasoline, booze, travel, etc.) because I did not keep track and indirect taxes (particularly my "share" of corporate taxes paid on the profits of companies in which I own shares and my company's share of my social security taxes), I must have paid more than 50% of my income over to the government. Barack Obama would add between 5 and 11 percentage points to that number, which means that my personal "tax freedom day" will be in August or September. MORE on motivation here. With math. I see that you are also into the elections. We can win the elections! This powerful viral tool that can make the difference by involving voters for a reason can be in your blog by a simple copy-and-paste, as you insert any photo or text. Your blog has the power to make the difference. Don’t miss this opportunity for this last week before the elections. Insert our candidate’s player in your blog in 1 minute. Paul the comment spammer: You, obviously, are in fact a "viral tool". TH ... just watched a little clip on the Factor of Bambi cracking a joke about sharing his toys and sandwich when he was a boy ... with the "they call me a redistributionist for that" ... I don't. I call him one for wanting to share my sandwich and piece of chicken. I do not touch your income, but paid a monsterous nut last year to our dear Uncle and the various states I worked in. When you consider what services aren't available to working stiffs, it's damned scary to think that the penalty for being productive is going up under his plan. @ John: when so many of the tax credits are contingent on working, it would seem that the productivity punishment argument is narrower than that. @ TH: Nominal or real figures? From what I have read, the US has the highest NOMINAL corporate tax rate (or thereabouts,), but a middling REAL one. Aren't the real figures the only ones that actually matter? What's sad about all this is that all the Centrist Kool-Aid drinkers will be sprinting to the Republicans in 2010 and 2012 after the economy feels the full effect of raising taxes in a recession and the passing of the Employee Free Choice Act. Sure, they don't like W (and there are many reasons not to), but does that mean that you go bi-polar and swing as far to the left as Obama is? The power to tax is the power to destroy. No honest man rests easy when the legislature is in session. Our only hope -- unless the polls are dead wrong -- is that Democrats from swing districts go "Blue Dog" and negotiate compromises within their own party that are more palateable than what is being talked about. But talk about how blind the suburban, centrist electorate is! If Obama wins, here's the first thing we should do: instead of getting angry or depressed, let's eject all the tax lawyers and accountants out of the country and close down all of the tax-preparation places like H&R Block. Once that's done, we can turn to the uber-rich twits who voted for Obama and tell them, "Now you can't escape paying your share of taxes. You voted for the Democrats, so now we're going to make sure you learn what their concept of 'fairness' really is." Sharing toys and peanut butter sandwiches as a kid must have excused him from having to give more than 1% of his income to charity as an adult—until he started to run for president, that is. That One's tin ear demonstrates clearly that he is too stupid even to begin to understand how dumb he is. Many of those countries listed have very high VAT rates. The US usually reserves the rough equivalent sales tax to the states and local governments. We (the US) have high progressive rates because we don't have a Federal VAT. While this information is not meaningless (fer shure! ), it doesn't exactly mean what some would intend it to mean. But since the US does not have a Federal VAT, it does illustrate that the revenue from personal income tax comes mainly from the top decile. Corporate income taxes are, of course, also a form of consumption tax, as no corporation adsorbs taxes to their bottom line without consideration of the prices of their goods and services. Bottom line: we need more rich people!! Let's all take lessons from DEC. I knew that I liked Switzerland for reasons other than great skiing and wonderful chocolate. NJ income taxes are pretty high considering what you get in return (not much), so you have my sympathy, TH. I think DEC should buy a villa on Lake Geneva and we can all go visit him there. Nominal versus real numbers are only appropriate when comparing one time period to another. If I read the table correctly, it's a cross-sectional set, not a time series. So the nomimal-real dichotomy is nonexistent. A TigerHawk readers party at DEC's palazzo does sound pretty good. The question is, where is it? David, it seems to me allowing for VAT taxes, which are highly regressive, the US would look even more progressive by comparison. While I agree this is not a comprehensive analysis of tax burden, it suggests the differences are even more stark because it compares the most progressive components of other tax systems to our primary taxation method. Sorry conservatives but these types of tax comparisons typically fail to incorporate all the deductions, tax shelters, gimmicks and loopholes. Fact is, when the dust settles, US tax policy is very regressive. But keep ignoring facts. See ya Wendesday HA HA HA! Dear Anonymous, i hope you are the first to feel the bite of that socialist and all his anti-American buddies. see YOU in 4 years - that is if you are able to survive. Testimony: "Sarah Palin's a brainiac"